Plain old tea has undergone a drastic makeover in the last few years, with infusions of herbs, flowers and flavours. While always known as a comforting beverage and an excuse for a chat, tea today has acquired a whole new dimension for the several health benefits that it can offer. Among the many variants of tea available, the best-known and most preferred is tulsi tea, or tea infused with basil. Kidney stones: Tulsi leaves are said to strengthen the kidney. Drinking tulsi tea every day for around 5-6 months could work towards expelling kidney stones, without medication or surgery. The stones will be naturally expelled through the urinary tract. Cough, cold, sore throat: The benefits of tulsi for the ever-annoying cold have been exalted for centuries by generations who literally pushed tulsi down our throats. Tulsi tea soothes the throat and helps control the cough. Respiratory disorders: Cough and cold is all very well, but tulsi tea can also help in more serious matters such as bronchitis, asthma and influenza. You can add cloves and a teaspoon of honey to the tea to make it an even more potent cure. Sleep: Regular tea and coffee contain caffeine, designed to give your energy levels a somewhat superficial boost and help you pull those all-nighters with greater ease. Tulsi tea however, is a sleep aid. This soothes your nervous system and helps you to sleep peacefully. Immunity: With long, irregular working hours, eating an abundance of easy-to-cook, processed food and high stress levels, immunity to various diseases is generally low among people. Tulsi tea boosts immunity, so you’re less prone to whatever disease or virus is floating around. Stress: This is the granddaddy of all tulsi tea’s health benefits. Tulsi is said to be packed to the brim with adaptogens, or stress-busters. In fact, people with high-stress jobs, or who are generally prone to throwing a fit over everything, are encouraged to drink up to four cups of tulsi tea every day. Stamina: If you’ve been feeling tired or run-down consistently, drink two cups of tulsi tea every day. Tulsi tea helps your body to use its supply of oxygen better, so you’re feeling brighter and more alert through the day. Cell-neutraliser: Our body is constantly producing and renewing cells, some of which may be malignant. 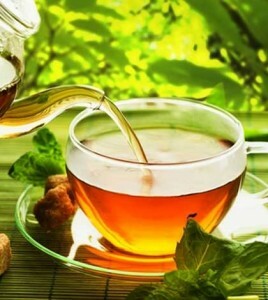 Tulsi tea neutralises these cells, which could lead to diseases such as cancer. Joint pains: Known for its anti-inflammatory properties, patients who suffer from arthritis or other joint-related diseases are encouraged to drink tulsi tea to bring down pain and swelling. Tulsi tea is routinely made by boiling fresh basil leaves in a litre of water. It can be drunk with the leaves still in it, or strained out. It is recommended that you keep the leaves in for added benefits, and you can chew them once the tea is done. Chewing basil leaves is said to be good for mouth ulcers too. If you’re not too sure about the taste of pure basil, add some honey, mint or ginger to vary the taste. Try not to add sugar, this rather defeats the health purpose. Tulsi tea is also available in tea-bags, but these usually contain caffeine and basis flavouring, so it’s better to make your own tea. Tulsi has been revered as a sacred plant for thousands of years and all its parts – branches, leaves etc are known to be beneficial. Used for purification, fragrance and even for luck, tulsi, in its its new avatar of tea is an excellent option for everyone.